This is a photographic record of the General Motors diesel locomotives of the former JŽ (Jugoslovenske Železnice; Yugoslavian Railways) locomotives in Kosovo, all taken 17-20/09/15. There is no photograph of 2620 016 as this locomotive had yet to be delivered at the time of my visit – although I’m sure I have a picture of it in Croatia that I hope to find soon! There are a handful of other GM diesels in Kosovo – four Swedish-built NoHABs acquired from NSB (the Norwegian State Railways) and also a curious, unique device now numbered 2640 010. This machine was built by TŽV Gredelj in Zagreb in 2010, as a heavy rebuild of withdrawn “Kennedy” 661 203 – although in practice only using the bogies and braking system from the 661. As the “original” 661 203 still stands largely intact, buried in a clump of trees in the scrap line at Fushë Kosovë, for the purposes of this survey the “rebuild” will feature in a future blog post about the new-build locos that Kosovo has obtained! My recent article regarding the current locations of the remaining ex-Deutsche Bundesbahn V200 class diesel-hydraulics attracted a great deal of interest. This brief blog post will look at where and when you can travel behind them in 2017. The two locos in operation this year are V200 033 – which is a “classic” V200 in that it retains its Maybach MD650 power units and Voith transmissions – and also V200 007 which is now Mercedes engined. V200 033 (ex DB 220033), 06:30 Unna via Hagen, Bochum, Recklinghausen to Munster Hbf, for 78.468 (steam) forward to Emden and back, then V200 033 back to the pick-up points but in the same order as the morning, terminating at Munster, €84. Operated by Eisenbahnfreunde Witten. Link. V200 033 (ex-DB 220033), Nürnberg area to Chemnitz, details TBC. Operated by Fränkische Museums-Eisenbahn. Link. Update 21/07/17: booking form has come out stating 216 224 to Plauen for 50 3648 forward, no mention of V200 any more. No traincrew available for the V200. V200 007 (ex DB 220007), Lübeck to Westerland and return. Operated by Historische Eisenbahnfahrzeuge Lübeck. Link. V200 033 (ex DB 220033), Recklinghausen Hbf to Cuxhaven and return, €79. Operated by Eisenbahnfreunde Witten. Link. V200 033 (ex DB 220033), Nürnberg via Bamberg, Gemünden, Aschaffenberg, Frankfurt Ost to Oberwesel and return. In connection with the “Rhein in Flames” event. Operated by Eisenbahn Nostalgiefahrten Bebra. More details awaited. Some here: Link. Advised very reliably on 04/09/17 that this is cancelled, but the promoter’s page still carries booking information for it! V200 033 (ex DB 220033) and 01.202 (steam), Rosenheim via München and Garmisch-Partenkirchen to Innsbruck, then return via Rosenheim to München. Operated by Eisenbahn Nostalgiefahrten Bebra. More details awaited. Some here: Link. V200 033 (ex-DB 220033), 07:45 Stuttgart Hbf to Titisee and return, €85. Operated by UEF. Link. V200 033 (ex DB 220033), Hamm to Bremen and return, €55. Operated by Museumseisenbahn Hamm. Link. There is also to be a Christmas special with V200 007, although details of date or destination have not yet been made public. Posted on May 11, 2017 September 8, 2017 CategoriesGermany, HungaryTags1989, Berlin Wall, Communism, East Germany, Eastern Europe, Hungary, locomotive, Pan-European Picnic, railway, Trabant, train1 Comment on The 230km/h Trabant! One of Europe’s fastest locomotives wears a unique livery prominently featuring the unmistakable shape of the infamous 23hp East German “Trabant” car. What’s it all about? 182 509 is a Siemens ES64U2-type loco, built in 2002 for their own spot-hire business, “Dispolok”, which was bought out by MRCE in 2006. It was one of two such machines (182 509 and 182 560) to get unique specially-designed liveries – different on each side – in summer 2014, to mark the impending 25th anniversary of the fall of Communism in Europe. 182 560’s was dedicated to the fall of the Berlin Wall, whereas 182 509’s was on the theme of the “Pan-European Picnic”, arguably a lesser-known event. So, what was the “Pan-European Picnic” and what is the livery all about? As I described in my article on the Flüchtlingszüge from Prague, 1989 saw burgeoning unrest through the Communist states behind the Iron Curtain, and history tells us that this resulted in the systematic collapse of the regimes in each of these countries by the end of the year. It was a watershed year but these momentous events were characterised not by shows of aggression (except in Romania) but by demonstrations of peace. One of the main characteristics of Eastern Europe in 1989 was the gathering pace of Mikhail Gorbachev’s policy of perestroika, of not interfering in the internal affairs of the Communist states. It was in this climate that the Hungarian Minister of State Imre Pozsgay and the Austrian Otto von Habsburg, an MEP and President of the International Pan-European Union, sponsored an event to be held near Sopron, a Hungarian town near to the Austrian border, on Saturday 19th August 1989. The theory was that the border between Hungary and Austria would be opened for a few hours, allowing people from both sides of the Iron Curtain to mingle, eat together (i.e. the picnic) and generally show that despite decades of propaganda to the contrary, those on both sides of the previously impregnable border between ideologies were not so different. What was not planned for, however, was the additional attendance of 600 enterprising East Germans who had been on their summer holidays in Hungary, had heard about the event and had decided to seize their opportunity to escape to the West. The border guards turned a blind eye to this and their “Republikflucht” had been successful. Again, history informs us that the border between Hungary and Austria was finally opened properly on 11th September and East Germans headed there in their droves in an attempt to leave – and (again, as described here) the dominoes had begun to fall that eventually resulted in the breach of the Berlin Wall – hence the liveries on 182509 and 182560 each commemorate events that neatly book-end what are probably the most significant twelve weeks in European history in the second half of the 20th century. And what of the “230km/h Trabant” in the title? These little two-stroke cars, manufactured by VEB Sachsenring in Zwickau, were ubiquitous in East Germany. They were the vehicles that East German families drove in to Hungary in their attempts at escaping, that were left abandoned on the streets of Prague as their owners crammed into the West German Embassy, and that smokily and noisily inched across the Berlin Wall when it was first opened on that landmark night in November 1989. As a result, Trabants became one of the most instantly-recognisable symbols of the events of 1989, and so it’s entirely appropriate that one is included in this design. The irony is that a vehicle that struggled to hit 100km/h in real life can now be “seen” flashing through the German countryside at well over double that! So, where is the best place to see the “Pan-European Picnic” loco? As a Dispolok machine, it lives a somewhat nomadic existence, but since it gained its special livery it has worked predominantly for DB (both on regional passenger services for DB Regio, and on Intercity expresses for DB Fernverkehr) but, since January 2017, it has been hired to the Swedish firm of Hector Rail. Although Hector Rail is based in Sweden, 182 509 is as yet only passed for use in Germany and Austria. As well as a number of freight flows across the former, Hector Rail have the contract to provide motive power for the crowd-funded open-access train operator Locomore, which have operated a Stuttgart to Berlin and return passenger service since December 2016. Although 182 517 has worked the lion’s share of these trains to date, 182 509 did have a stint of a several days working this in May 2017, which is when the photos in this article were taken. The tale of how the state railway of Communist Hungary came to procure American-engined locomotives, even as the Soviets affirmed their power over it, is an intriguing and obviously very politically-charged one. The Hungarian State Railways (Magyar Államvasutak; MÁV) first dipped its toe in the water regarding diesel traction in the late 1930s but, in common with most other European countries in the same boat, any plans were put on indefinite hold by the advent of World War 2. Sadly, as much as an unfortunate consequence of geography as anything, Hungary was to suffer an astonishing amount of destruction during the conflict, and its railways were a key strategic target – indeed, 17% of all war damage sustained by Hungary was to its railways. As a result, 1945 did not leave it in a position to pick up where it left off; significant reconstruction to merely return the railways to something approaching an operable state was the priority. As a result, it was well into the 1950s before MÁV could re-investigate main line diesel traction. It’s important to interject here that the 1950s did not bring harmony to Hungary. In common with the rest of Eastern Europe, it was subject to an enforced process of “Sovietisation”, with the political, ideological, social and economic norms of the Soviet Union being forced upon it. However, this was not universally popular in Hungary. Occupied by the Germans from the west, and invaded by the Russians from the east, the Hungarians had seen the worst of both sides and 600,000 of its civilians had died in the conflict between the two on its soil. Many saw the Red Army not as a liberating force but in the same light as they viewed the Nazis. The unnatural implementation of Soviet policies on Hungary led to a revolt by the Hungarian people in Autumn 1956. This challenge to their authority was ruthlessly crushed by the Soviets, resulting in the deaths of around 3,000 Hungarian civilians, and served to harshly underline the power that Moscow held over it. A link to a British Pathe film from 1956, neatly describing the uprising (some disturbing scenes, but then again it was a disturbing event). The forced industrialisation that “Sovietisation” brought to Hungary in the 1950s resulted in a drastically increased requirement for motive power for freight traffic, hitherto fairly quiet routes now became important freight arteries. Hungary was now a world of “five year plans”, where (often arbitrary) delivery targets were met regardless of how complete the product was. At the same time, with propaganda in mind, labour competitions were to be seen in many areas of Hungarian industry and the railways were no exception – one ambition was to have each working locomotive cover at least 500km each day in the name of keeping the wheels of industry turning (this turned out to be too ambitious by quite some margin). The upshot of all of this is that more and more trains were required to be run, and as a result, more motive power was required. The obvious solution was diesel traction, which could result in increased efficiency and reduced costs compared to the ubiquitous steam traction in use at the time. Modern traction would also provide ideal propaganda in a country that was being rapidly modernised. MÁV naturally turned its attention domestically; to the primary Hungarian rolling stock manufacturer – Budapest-based Ganz – which after a period building tanks and Messerschmitt Bf109s during the war, was now returning to the railway market. However, it was primarily turning out electrics, such as the Co-Bo class V55s. Diesels were not its forte – however, in 1957, it was able to turn out the M601 – a 2,000hp, 141t 1-Co-Co-1 diesel-electric prototype. The M601 was not a success by any stretch of the imagination. It survived less than a year; a catastrophic crankshaft failure on this unique locomotive during trials effectively ended not only its career, but Ganz’s hopes of contracts to provide locomotives to other Communist nations in the early years of dieselisation on the spot. None of this helped MÁV in its increasingly-urgent search for diesels, though. Bitten once, they were twice shy in trying unproven traction, and wished for something “off the shelf”. With only diesel shunters being successfully produced in its own country, it looked to elsewhere in the Communist Bloc; with most of Eastern Europe similarly engaged in rebuilding decimated railway networks, only mother Russia was building main line diesels in any numbers. Indeed, off the back of the M601 debacle, the Soviet Union offered a version of their TE3 diesel-electric locomotive, but MÁV quickly declined this offer, deeming it entirely inappropriate for their needs – being too big and too heavy. Having fruitlessly looked east, MÁV naturally swivelled its eyes to the west, where diesels were increasingly ousting steam, and with significant success. At the time (the late 1950s), arguably the two most successful main line diesel locomotive types in Western Europe were the General Motors-engined diesel-electrics built under licence by Nydqvist & Holm AB (“NoHAB”) in Trollhättan, Sweden and meeting the challenges that Scandinavia threw at them, and the Maybach-engined diesel-hydraulics from Krauss-Maffei that were revolutionising the Deutsche Bundesbahn in West Germany. In February 1960, arrangements were finalised for MÁV to receive demonstrators of both. The above is a link to a 17-minute MÁV promotional video from 1978 (“Hív a vasút! Vár a MÁV!”) focussing on the fruits of the efforts that had gone into the modernisation of the Hungarian railways in the 1950s, 1960s and 1970s – it makes very interesting viewing four decades on. First to arrive, that May, was the NoHAB. This 1,950hp machine was not strictly a manufacturer’s demonstrator, as it had been intended for sale to Finland, but VR (Finnish State Railways) did not take up the order. This green-liveried locomotive undertook a two-week tour of Hungary, being comprehensively put through its paces on a variety of duties, both freight and passenger, exceeding requirements in all areas. It was also demonstrated in Romania, Bulgaria and the DDR (East Germany); there are some really interesting photos of its brief spell in the latter in July 1960 on this link. The loco returned to Scandinavia at the end of its tour, and in the August joined the books of NSB (Norwegian State Railways), numbered Di3.623, with whom it served for the next 40 years. As a brief aside, Di3.623 is thought not to be the first NoHAB diesel to traverse Hungarian metals. Back in 1955, Di3.602 (now preserved in Norway) passed through whilst undertaking its own demonstration tour, visiting Yugoslavia, Greece and Turkey, an itinerary also followed by Krauss-Maffei’s V200 005 the same year. Whilst in Turkey, the NoHAB certainly worked as far as Ankara, and is even reported to have reached the Syrian border! Not bad for a loco that went on to earn its keep working into the Arctic Circle! The Krauss-Maffei loco arrived in Hungary for its period of testing in the July. This loco was broadly based on the V200 class of diesel-hydraulics, but took advantage of several years’ worth of technological development – it being a six-axle variant of the four-axle V200 design – although still clocking in at only 101t. It had been built as an add-on to the order of three such locos supplied to Jugoslovenske Železnice in 1957 to power Marshal Tito’s private “Blue Train”, but had been rebuilt in 1958 as a truly unique demonstrator – losing its two Maybach MD650 power units of 1,100hp each in favour of two 1,500hp MD655s. Speaking in British Rail metaphors, it was turned from a “Warship” into a “Western” (albeit with Mekydro transmissions). It had proven itself an exceedingly capable machine throughout testing in Austria and Bavaria, but had thus far resulted in no orders. For its Hungarian testing, it received the number “M61.2001”. It again was a tremendous success in terms of the specific tests carried out in Hungary; however, MÁV were discouraged by its two-engine design, which was entirely alien to anything it had clapped eyes on before, and also its hydraulic transmission – after it’d had bad initial experiences with its M31s (although history shows that it did successfully embrace hydraulic transmission eventually). As a result, the order was placed with NoHAB, initially for 20 machines. NoHAB built them at Trollhättan and, as if to underscore their “out of the box” quality, they delivered themselves to Hungary between May 1963 and March 1964. In ones and twos, they were worked via the Trelleborg to Sassnitz train ferry, thence the DDR and Czechoslovakia, with journeys taking up to twelve days. As well as themselves, they brought copious amounts of spares, occasionally in volumes filling complete wagons. The locos were emblazoned with signage trumpeting “Noch eine NoHAB-GM lokomotive nach Ungarn”: “Another NoHAB-GM loco to Hungary”. This can only have been for the benefit of the East German Deutsche Reichsbahn; the message was not in Czech, or Hungarian for that matter! However, regardless of the success or otherwise of their experience with Di3.623, DR did not declare any interest. East Germany may not have procured its own NoHABs, but in 1968 – a number of years after the opportunity had presented itself – it did (perhaps oddly) select an M61 as one of the trains featured on a postage stamp produced for the Leipzig autumn fair. At this point it’d be prudent to mention the elephant in the room – given the incredibly delicate political situation at the time, and with the Soviet Union unhesitatingly resorting to using force to assert its power in Hungary – how was MÁV getting away with procuring traction built outside Moscow’s sphere of influence to a design from the “wrong” side of the Iron Curtain? Firstly, it must be established that the Iron Curtain was not a solid barrier. Goods and services crossed it all the time. This extended to rolling stock too; for example, PKP (Polish State Railways) had obtained its twenty EU06 class electrics from English Electric at their Vulcan Foundry in Newton-le-Willows in 1962; the trade even went the other way, an obvious example being Electroputere in Craiova, Romania, being sub-contracted to construct the first thirty Class 56 locos for British Rail in the mid-1970s. That is not to say that trade across the black-and-white divide between “Capitalist” and “Communist” countries was straightforward or even encouraged. Conspiracy theories continue to circulate that the sinking of the MV Magdeburg in the Thames Estuary in October 1964, whilst conveying 42 British-built Leyland Olympic buses bound for Cuba, was orchestrated by the CIA – the USA having imposed a trade embargo on Cuba, which it “encouraged” its allies to follow, in the wake of the Cuban Missile Crisis. The supply of 10 diesel locomotives to Cuba the following year by Brush Traction was deemed so politically sensitive by Brush’s parent company Hawker-Siddeley, keen to protect its business opportunities in the USA, that all references in publicity were not to Brush but to the innocuous Clayton Equipment Co. of Hatton, Derbyshire and the machines were constructed not at Brush’s Falcon Works in Loughborough, but at Internal Combustion’s site in Derby. It was business that these companies in the “capitalist West” wanted, but depending on the circumstances, they did not necessarily want it to be common knowledge. However, Sweden was not necessarily the “wrong” side of the Iron Curtain, depending on your viewpoint. It was ostensibly neutral in the Cold War, and as such maintained trade links with both sides with minimum concern to either side. Its very neutrality had a strategic purpose – forming, as it did, something of a tangible, physical barrier between “East” and “West”, although this barrier would surely have counted for nothing in the event of nuclear conflict! Despite all this, the decision to source traction from the Swedes was not popular with the Soviets. The award of a contract to even a “neutral” country was seen as taking work away from the Comecon nations; that is, those who had joined the “Council for Mutual Economic Assistance”, the economic union of nations aligned with Moscow. This would perhaps have been negated if GM/NoHAB had granted Ganz a licence to construct a production batch of locos in Budapest; as they had in the 1950s when the Belgian company AFB (Anglo-Franco-Belge) had built the class 202, 203 and 204 locos for SNCB and the class 16s for CFL in Luxembourg. This is what had happened with the English Electric EU06 design (the first 20 locos were supplied complete from England; but nearly 500 Polish licence-built examples followed); it is what was eventually done for the 18-cylinder Pielstick power units for MÁV’s class M63 diesels in the 1970s (see a stunning photo by Philip Wormald here), for example, and also for the Fiat power units for PKP’s SP45s. This would have been a win-win solution; the workers’ jobs seen to be protected, professional dignity preserved, and arguably superior locomotives provided. That licence, however, was not forthcoming. At roughly the same time, the Russians finally reached a position to provide a diesel loco that, on paper at least, began to meet MÁV’s needs. 1964 saw an order for twenty machines; 1965 saw a follow-on order for another 32. These were the first 52 locomotives of the type that went on to be known, not just on MÁV but also worldwide, as “M62s”. The M62s were not the immediate across-the-board success that the NoHABs had been – developed as they were in the Soviet Union, and not specifically for Hungary’s requirements, they did not feature any sort of train heating capability (Russian convention being to heat each coach individually). As a result, steam vans had to be cobbled together – initially using boilers retrieved from withdrawn class 275 2-4-2T steam locos – and then electric train heating vans, in order to make them viable motive power for passenger trains through Hungary’s colder months. In contrast, the M61s proved ideal “out of the box” and met all expectations, and MÁV was very pleased with them. It is no secret that those involved in their operation would have liked more. NoHAB were certainly equipped to build them, and even offered a more powerful version (using a 20-cylinder 645-series power unit, as in the DSB MZ class, as opposed to the M61s’ 16-pot 567-series power units). However, as these would need to be sourced from a non-Comecon nation, and as a loco of the equivalent power classification was now available from the Soviet Union, any further orders were always going to go to Lugansk and not Trollhättan – regardless of the real-world differences in MÁV’s early experiences of the two. Further M62 teething troubles required ironing out even as further batches were ordered and delivered, although it must be conceded that the locos eventually settled down to give good service over many decades. MÁV’s M62 fleet eventually totalled 288 machines, by far and away Hungary’s most numerous diesel locomotive type. Eventually, over 7,000 production series M62-type locos went on to be produced, for markets as far afield as Cuba, Mongolia and North Korea – but MÁV’s M62.001 (still going today) was the very first of them. It’s an interesting “what might have been”, though, to consider how different Hungary’s motive power scene would have looked over the last half a century if the circumstances or timeline had been slightly different. The above is a link to a video uploaded to YouTube by Becsky András featuring some interesting M61 scenes from 1996. The last M61 was withdrawn from normal service in 2000, however seven survive – all still in Hungary – and can semi-frequently be sampled on mainline railtours and occasional seasonal service trains. As an aside, Di3.623 – the demonstrator from 57 years ago that led to the M61 order – was withdrawn from private use in Sweden following fire damage in 2014. It was purchased the following year by the Hungarian NOHAB-GM Foundation and “repatriated” to Budapest where, after repair, it will join their operational fleet, ostensibly as “M61.623”. One of the most popular European diesel locomotive types is the “Ludmilla” family; powerful machines built in the Soviet Union for the Deutsche Reichsbahn of East Germany. Of a total fleet of 873 locos, only 242 are thought to remain extant – roughly a sixth of which have now left Germany. This article is not intended as a history of these locos, although I am in the process of writing one. Rather, this is a roll-call of those that have survived to the current date (01/05/17), with details of where they can now be found, plus dates of recent photographs and sightings, with links to them. This list is correct and up-to-date to the best of my knowledge, but trying to keep tabs on several hundred locomotives spread across the continent can be like herding cats – so if you’re aware of any corrections required, please let me know! 232 096 Unknown, last reported at Eisenach ?? 232 434 Unknown, last reported at Nymburk ??? 232 601 Wedler Franz Logistik GmbH, Germany Operational? 15th May 2016 saw “Lollo” V160 002 (DB 216 002) work a mainline railtour from Treysa to Klein Mahner and back, to the delight of a large contingent of British enthusiasts on board. British modern traction enthusiasts have been travelling to foreign shores in significant numbers to feed their interest for over 40 years. Although – as I hope this website will show you – the decision to make this first trip can be the gateway to an almost infinite number of different railway experiences, the first time that many ventured overseas was in search of things that reminded them of home; exported ex-BR “EM2” electrics in the Netherlands, for example, or Vulcan Foundry-built 8 and 16-cylinder English Electrics in Portugal. But one of the oldest and most enduring subjects of our attention have been the Maybach-powered diesel-hydraulic locomotives of the former West Germany. The “Western” class diesel-hydraulics of British Rail were the first modern traction type to gain a significant following, and after D1013 and D1023 drew to a halt at London’s Paddington station at 23:41 on Saturday 26th February 1977, it was assumed that the glorious sound of Maybachs would never again be heard on the front of a train on the main line in the UK (that assumption, by the way, was wrong!). 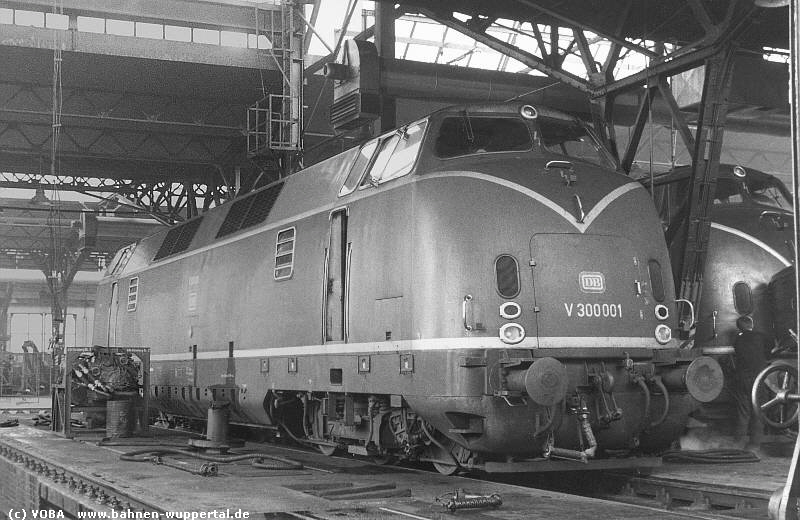 That was an experience now to be found only overseas, predominantly in West Germany with the Deutsche Bundesbahn V200.0 class of locomotives, which were built with twin MD650 power units and Voith transmissions and were the forerunners of our own “Warship” locos. These lasted in main line passenger service until 1984; you can still rely on a sizeable British booking on most railtours hauled by preserved machine V200 033 even now. The V200.0s may have been almost identical to BR’s Swindon-built D800s, not least visually, but they were certainly not the only Maybachs that Deutsche Bundesbahn had had. It’s a commonly-repeated misconception that the Vorserienloks (prototype batch) of Class 216 – the first ten machines of the “V160 family” that eventually totalled 800 locos, some of which are still in use on front-line passenger work today – were the same as BR’s D7000 “Hymeks”. This is not strictly true – the German machines were indeed built with Maybach MD870 power units, as were as the “Hymeks”, but they had Voith as opposed to Mekydro transmissions, and this does make an appreciable audible difference. The last of this small batch of 10 machines, nicknamed “Lollos”, worked its last train for DB in 1981. This was not the end of the story, though, as five examples escaped the cutter’s torch – one for preservation (V160 003, although this has now sadly lost its MD870), and four for private non-passenger use – three of these ended up in Italy, and one, V160 002, in Spain. This article is not a history of Maybach traction in Germany, however (that will come at a later date). This is a review of a railtour hauled by a truly hellfire locomotive. A bit of historical scene-setting first, though: V160 002, later numbered 216 002, was repatriated from Spain by a private individual in 2010 and restored in the works at Neustrelitz. It emerged in 2015 in almost-original condition, and as well as some work on main line freights for RailSystems RP, worked passenger trains at a special event on the Kurhessenbahn in the September 2015, a trip paired with V200 033 in April 2016, and some heritage-themed shuttles between Coesfeld and Dorsten in May 2016. Its first proper solo railtour, however, was scheduled for 15th May 2016, and this was immensely popular with British enthusiasts. A fair few, like me, had never even had the chance to ride behind a “Hymek” on the main line, so it was a totally new experience. This was a trip starting at Treysa and running via Kassel, Göttingen, Hildesheim, Oker and Vienenburg to Braunschweig. The run between Hildesheim and Oker was with the express intention of commemorating the reign of the DB class 218 “rabbit” locos, which had been withdrawn from service on the much-loved Hannover to Bad Harzburg route which used this section of line, at the end of 2014. The “Lollo” ran round at Braunschweig and headed south the short distance to Salzgitter Bad where, after another reversal, it gained the route to the tour’s nominal destination of Klein Mahner, home and operating base of the Dampflok-Gemeinschaft 41 096 e.V. Klein Mahner was a familiar destination to those of us who had travelled on the “Stahlstadtexpress” railtour in May 2014, which itself had been operated as a farewell to Braunschweig’s 218 447. However, on that occasion, the 218 had not been permitted to traverse the full line, and it had been the only motive power of the day. This visit was to prove different. One of the railtour coaches was uncoupled, and taken forward to the end of the line at the junction of Börßum and back by diminutive class 323 (Köf) diesel shunter, 323 479. It was perhaps hard to believe that this loco was 82 years old at the time, its entry to traffic having been on 12th October 1933! Back at Klein Mahner, we regained the V160 and set forth on a brief tour of the freight-only lines threading through the sprawling steelworks complex that sits between Salzgitter and Peine. Some of us, again, were no strangers to this route – it also having featured on the 218 447 railtour in 2014 – but it was an interesting way to spend an hour or so, nonetheless. The noise levels were ramped up a notch or several when we regained the main line, however, which was well-received by all! Although there were to be two further reversals, that was the branch lines dispensed with for the day, and thrash and speed were sustained all the way back to Treysa. I think it is no exaggeration to say that everybody who travelled on this railtour was very impressed with the loco. The atmosphere on the train was brilliant, and apart from those with D1015 at the helm, it eclipsed every railtour I’ve travelled on in the UK in recent memory in just about every aspect. I made a video of the day and uploaded it to YouTube, and it can be seen below. It’s 24 minutes long, but it gives a good overview of the day, with plenty of MD870 thrash for you to enjoy! V160 002 has recently re-entered traffic after a period out of service, and is advertised for a sensibly-priced and timed railtour from Piesberg (near Osnabrück) to the Christmas market at Goslar on Saturday 9th December 2017, followed by another on Saturday 3rd February 2018 from Münster Hbf to Willingen and return (link). If you like your diesel-hydraulics, you will certainly not regret ensuring you are there!